Most decals on this site are based off sizing measured LEFT TO RIGHT as shown in the image. There are a few exceptions (like stick figures which is based off height) but this will be clearly stated on the ordering form if the decal is not based off width. If the size you are wanting is not listed please use the contact form to inquire. All decals are made proportional so they appear correct when you select your custom size. You may always specify in the comments box if you would like the design to be skewed to fit a certain dimension but skewing too much can make the decal appear "squashed". So please beware of this before you make a note for us to skew. In between sizes (such as 7.5, 8.25, etc.) can be had at no additional cost. Just round up to the next largest size and note in the comments box the precise size you need. Height for most designs can be seen just below the thumbnail image on the order form. 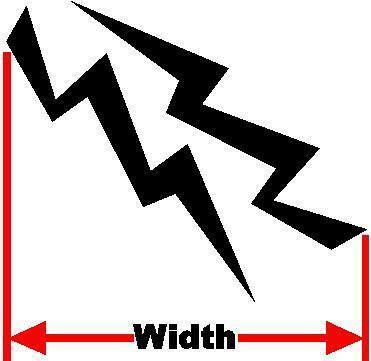 Simply change the width you height to what you want and the other dimension will be adjusted. Note that the width is from the furthest left part of the design to the furthest right part of the design. This is a horizontal measurement (shown) and is not from actual point-to-point. See another example below. Below is a size chart that should be used for how big a decal needs to be to be viewable from a certain distance. This is based on lettering using a normal font. A more detailed font or design may require closer viewing distances.